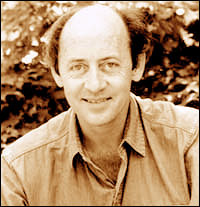 Preface: Every chair in the Terrace Room was filled as Billy Collins began his Poetry Colloquium. Prof. Eavand Boland told the gathering that there will be refreshment after the talk. Collins said, "I feel I'm the barrier between you and the refreshment." My notes are below with web links. References denoted in [brackets] are my additions. I think Ezra Pound said that a professor talks for an hour. "A poem should not mean/But be." Thomas Hardy: "Poetry is emotion put into measure." Poetry can do two things at the same time. W. H. Auden: "Poetry is the clear expression of mixed feelings"
Students are frustrated because poetry is fluid. If you're an English major, that's the pleasure of poetry. It's not strapped down like other forms of writing. I wrote a poem "Poetry"
come to graze over the evening clouds. before history trickles over a concrete lip. over the many fences of a plot. how curtains were blowing in the bedroom. to face the many-eyed darkness of the house. Poetry is no place for that. and singing songs to a bird in a cage. or, better still, nobody on that bridge at all. Q: What about the narrative poem? A: Poetry is so vast. It's like sports badminton and football with linebackers. Usually when we speak of poetry, it's the lyric poem. Stephen Dobyns writes short narrative poems. Now the narrative poem has been replaced by the Outburst. Poems were used historically as a mnemonic device. How many days in October? in August? Q: Is the Outburst confessional poetry? had something to confess, exciting life to reveal. Plath and Berryman too had much to confess. to get attention without embarrassment. To me, poetry is an extension of the diary. while boys were outside beating each other up. The lock of a diary had the shape of a heart. Poetry is writing about feelings. Poetry has form & gives pleasure. it gave him lots of fun and pleasure. That's the tension of literature. That's why poetry is more satisfying. Q: Who are the poets that inspired you? pull a lawn mower from your pants. My mother in Canada had lots of poems. My mother died at age 95.
went through brooding Romantic genius period. and tried to write fake Stevens poems. Envy that's how I want to be influenced. Listen to jazz musicians do things I can't do. Jorie Graham is admirable. But I don't want to write like her. Charles Simic makes me steam. I want to write like him. "The complaceny of this student"
Q: Having been a Poet Laureate, what are your thoughts? Early 20th century audience were driven. What cards to turn over, which to face down. All turned down then there's no game. there's mysteriousness at the end. I don't read poetry to learn about you. then I'm seduced into caring. Q: Why people disparage your poems and those of Mary Oliver? A: Has to do with the audience. getting a poem read each day in school. Teachers were still reading Williams' "Red Wheelbarrow"
Here's a poem for today that didn't need teacher's intervention. Poems that give pleasure at the first reading. Now the website Poetry 180 gets a million hits a month. an email from a woman flying from Istanbul listening to poetry. Q: What's the website's URL? A: It's linked on www.loc.gov and I update the site occasionally. Q: (Eavand Boland) American poet laureates have done so much. poems about the royal family. was the only way of preserving the occasion for history. British laureates have a ten-year tenure. We should go to lifetime. We've had 19 poet laureates [12 since Robert Penn Warren, 1986]. Tennyson was the British Poet Laureate for 47 years [42 years from 1850-1892]. Q: I heard the poetry channel and jazz on my flight. A: Did you find it in their In-Flight magazine? Two people who sell to the airline channels approached me to do this. Q: Who had the idea of putting poetry in hotels? A: Joseph Brodsky said "We should have poetry in supermarkets and motels." Q: I share your poems to my high school students. They ask me, "Did he write that? Is it that effortless like a basketball lay-up?" A: I usually write my poems in a single sitting 20 minutes or an hour. my poem creates its own conclusion, destination. Have a sense of beginning, middle, end. Then I make adjustments for cadence, sound. Try to write good lines. it turns back and creates shape. Q: Could you read your poem "Sonnet"? A: You know Petrarch wrote love sonnets to Laura.